protection of personal information, pursuant to the applicable regulations. acknowledgement of receipt to the office address or to the secondary unit of the Company. The Requests will be answered within the legal term. „unsubscribe” link via received e-mail. deleted. For users that register on this website (if any), we also store the personal information they provide in their user profile. All users can see, edit, or delete their personal information at any time (except they cannot change their username). Website administrators can also see and edit that information. collects the following data: client’s name, surname and e-mail address. Chapter II – How do we process this information? order to fulfill its legal obligations (such as issuing invoices). person concerned, by performing its contractual and legal obligations. proves impossible or involves disproportionate efforts. another operator, if feasible from a technical point of view. is in the public interest or does not have a legitimate interest in the controller. right to oppose at any time to the processing. the prior notice or request of the person. information technology, payments, sales, marketing, data analysis, research and surveys. individuals with regard to processing of personal data and on free movement of such data. with legal provisions, legal procedures or to answer to a request from public authorities. identify, record archive and report, where appropriate, all security incidents. attention of the Data Protection Officer. offering each user a unique experience. can access it again and only when a user returns to the website. 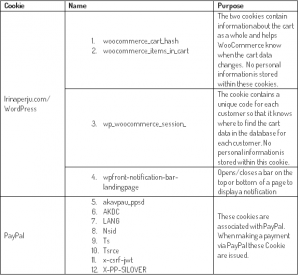 Additional information about cookies can be found visiting the developer’s page. – Opera – click here.